Lisbon is a city with thousands of years of human habitation behind it, so whenever there is construction in the heart of that involves foundation or basement work, the site must be archaeologically surveyed first. 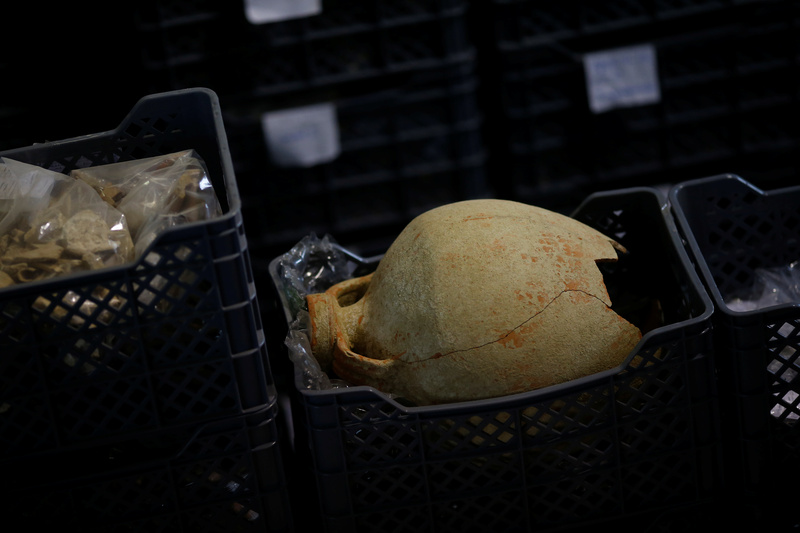 So in 2016 when one its most famous restaurants, Solar dos Presuntos, a culinary icon of the city renown for its traditional Portuguese fare, decided to expand its kitchen and build a school attached to the restaurant, archaeologists got first crack at the site. Contractor archaeology company Neoepica was hired to work on this project, beginning with a preliminary study, diagnostic and test pits. Lisbon has a rich history going back to the Neolithic and there were Phoenicians living in what would become Lisbon since at least 1200 B.C. Rome established a foothill in what they called Olissipo after the defeat of Carthage by Scipio Africanus in 206 B.C. The city was an important and prosperous trade center, thanks to its location on the Atlantic Ocean and Tagus river. Lisbon’s main square, the Praça da Figueira, is located over a major Roman cemetery in use from the 1st through the 4th century. With all this density of history in the city center, archaeologists expected to make some discoveries where the restaurant was planning its addition, but because later construction often makes mincemeat of ancient remains, they weren’t expecting to hit a motherlode of Roman material. 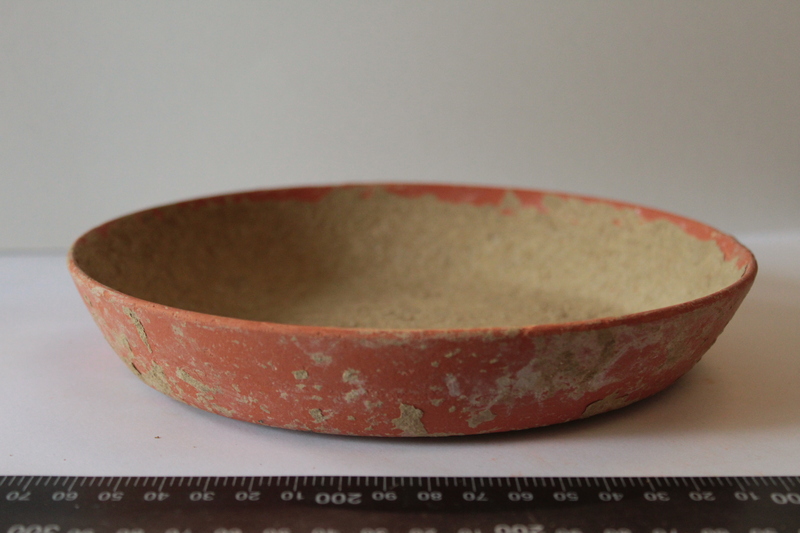 First they discovered 16th and 15th century artifacts, primarily pottery — dishes, cups, vessels — in very good condition. Then the bones began to appear. Twenty feet under the surface, the team unearthed 28 skeletons from inhumation burials and urns containing the ashes of multiple individuals. 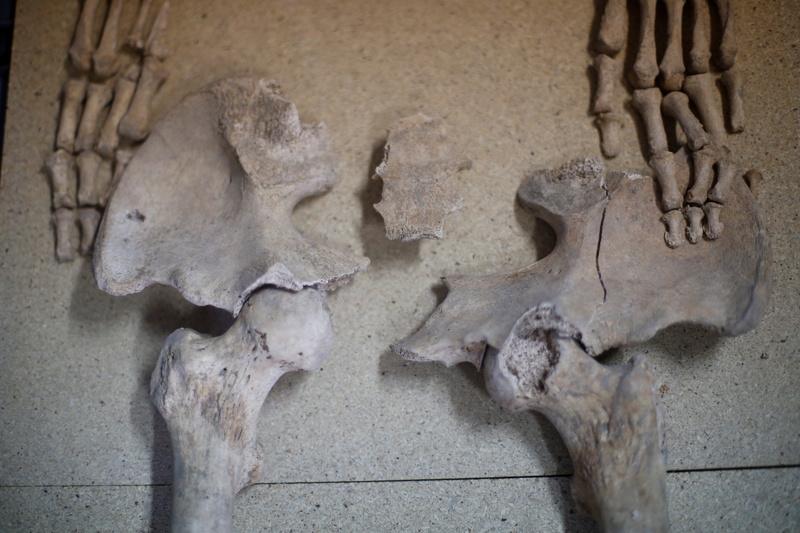 Altogether, the remains of 60 people were found in the cemetery. 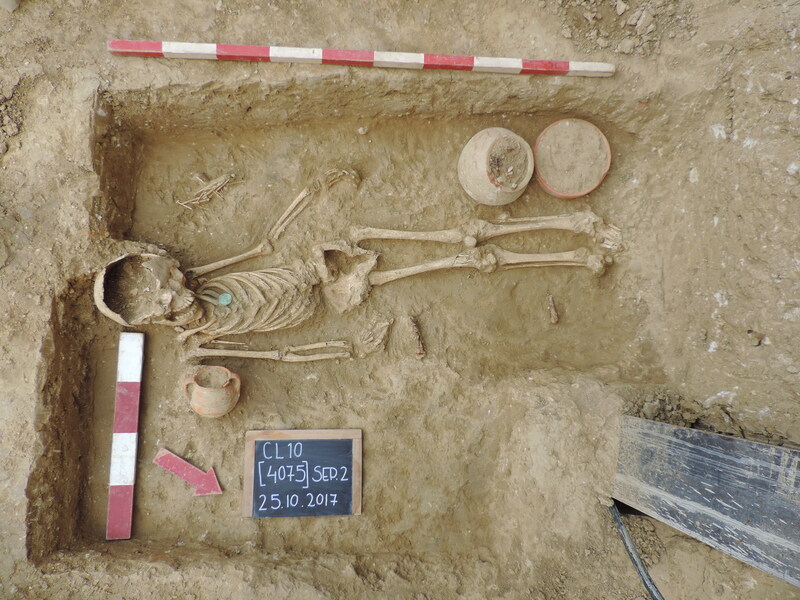 Several of the inhumations included grave goods and funerary offerings left at the time of burial. These include typical Roman offerings like lamps, which illuminated the way to the underworld, and coins to secure the deceased would have the wherewithal to pay their way. There’s also a highly unusual object that is still in the process of being studied and evaluated, but appears to be a doctor’s case containing surgical instruments. The finds are mostly in excellent condition. Neoepica archaeologist Paulo Rebelo described it as “possibly the best-preserved Roman necropolis found in recent times.” The remains have not been radiocarbon dated yet, but based on the objects found, the cemetery dates to the 2nd or 3rd century. The borders of the cemetery have not been pinpointed by this excavation. The team dug a little further afield and found additional traces of the necropolis in several directions. The archaeological material in the planned construction area has been salvaged, so the expansion of the restaurant will now be allowed to proceed. The finds have been transferred to Neoepica’s research laboratory. When the study is complete, the remains will be given to the city council which will determine where they will go on display. This entry was posted on Sunday, January 27th, 2019 at 11:26 PM	and is filed under Ancient. You can follow any responses to this entry through the RSS 2.0 feed. You can skip to the end and leave a response. Pinging is currently not allowed. Ah, standing on the shoulders of giant cemeteries, learning to cook over the feet of one’s predecessors. Back in the very early nineties, our juvenile team won a four day trip to Lisbon, which included the full gastronomic program. Also, we saw the aqueduct, Belem, castles in Lisbon and Sintra, the stock exchange, a fish market and basically all that the ‘Marquês de Pombal’ had erected after the terrible quake of 1755. They even had a funfair and their local Saint’s day of festivity, where people could effectively get rid of their remaining senses for gravity. Alis Ubbo, Ολισσιπόνα / Ulyssippo(na), Al-Ushbūna ..up to just ‘Lisbon’. Did I mention their famous cable railways? The ‘Ascensor do Lavra’ was opened in 1884. The numbers 150 (the ham restaurant) and 151, ‘Rua das Portas de Stº Antão’ are located to the right of the lower station of that ‘Elevador/Ascensor do Lavra’ (to the peak it gains 43 meters and the maximal gradient is 25 percent, which is quite steep). As far as the (Roman) ancient city is concerned, there is the 1st ‘Bairro’ (where the stock exchange had been), there certainly was some form of hill settlement, where today the Castle of São Jorge is overlooking the historical center, and leading to NW (Cascais and Sintra), the ‘Avenida da Liberdade’ might have been a Roman road with graves to the right (a small strip up to that hill with the Elevador) and possibly to the left also.